Hyundai recalls 120,000 Tucsons with oil pans that leak and cause damaged engines and fires. 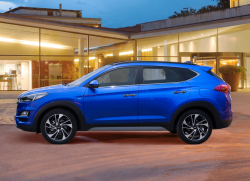 February 28, 2019 — A Hyundai Tucson oil leak recall has been issued for 120,000 model year 2011-2013 Tucsons, but Hyundai doesn't know how or when dealerships will fix the problem. According to the automaker, the engine oil pans can leak between the pans and engine blocks and cause engine damage, stalled engines or engine fires. Hyundai and safety regulators believe there were problems with the sealant used for the oil pans. The National Highway Traffic Safety Administration (NHTSA) opened an investigation into how Hyundai handled engine recalls involving 2011-2014 Sonata and 2013-2014 Santa Fe Sport vehicles. Safety regulators told Hyundai they wanted data showing engine claim rates for all vehicles equipped with similar engines, with the Tucsons included on that list. NHTSA analyzed the data and had concerns about the claim rates for non-collision fires and engine stall incidents in Tucson SUVs, leading Hyundai to check returned parts for 2011-2013 Tucsons. According to the government, the data showed problems with oil leaking from the pans, although Hyundai couldn't find any related crashes or injuries. Nevertheless, NHTSA told the automaker a recall would be the best course of action based on a growing trend of complaints, but the U.S. government shutdown erased planned meetings between Hyundai and safety regulators. NHTSA says no crashes or injuries have been reported by Tucson owners, but regulators didn't say how many fires are attributed to oil pan leaks. Drivers may receive a few warnings if oil is leaking, including oil on the ground where the vehicles are parked or seeing oil on underbody surfaces. There may also be knocking sounds coming from the engines, odors or smoke from oil leaking onto hot surfaces, hesitating engines and illuminated oil and engine warning lights. In addition, Hyundai says it is trying to figure out the best way to fix the SUVs because the investigation into the fires is ongoing. Tucson customers should watch for recall notices by the end of March 2019, then second letters will be mailed once Hyundai dealers are ready to perform repairs. The automaker also says it will reimburse customers who have already paid for repairs related to leaking oil pans. If you own a 2011-2013 Hyundai Tucson and have questions, call the automaker at 855-371-9460 and refer to recall number 181.